A curious, or cautionary, tale depending on how you feel. At the height of the investigation into Alex Salmond, he set up a Crowdfunding to help with his legal costs. was rejected again! While I contemplated my next move, the telephone rang; I answered the call and an electronic female voice queried what I was doing. She asked some questions, innocuous as far as I could tell, claiming to be from the Bank of Scotland and giving me a number to ring if I needed more information. I was unable to ask any questions, just answer her electronic ones. I rang off, and after my tea I attempted to phone the Bank of Scotland, running down the list of numbers in the Telephone Directory but none of them answered. Finally I tried the number on the back of my Card and got a response; after answering their questions I was transferred to the Fraud Department. I asked if the call had been a scam but was assured it was not, and that the system was alerted to transactions of an unusual nature, and was to prevent misuse of my card. Apparently the transaction was “unusual” in my case, hence the block. I said it might have been helpful if a real person had made the call. In one way it is good to know that steps are taken to protect your account, but nothing like this has ever happened to me. Both my sons said they had had similar experiences , usually when booking flights so not to worry. What intrigued me is that it was a payment to Alex Salmond’s Crowdfunding – hmm! I did not proceed with the donation, but Alex managed to get over £100,000 without my help. As far as I am aware, the Scottish Labour Leader, Richard the Learner, has been waffling on about his support for Federalism. He is definitely against Independence, but might change if Jeremy Corbyn thinks it is a good idea. Federalism was the love child of the Liberals in days gone by. I remember questioning the late Jo Grimond, leader of the Liberal Party and MP for Orkney and Shetland at a Liberal Adoption Meeting in Peterhead in the late Sixties. I asked him to give a timescale towards Federation; he answered the question, vaguely, three times. I state “vaguely” because he did not answer it, to rapturous applause. At the conclusion of that meeting the adopted Liberal Candidate, Mr Hoyer Miller, praised Mr Grimond and stated “If we cannot have him as Prime Minister for All England, then let us have him as Prime Minister for Scotland”- to rapturous applause. Anyway Mr Leonard is now latching on to the Ghost, presumably not aware of what Federalism actually means. The system of federalism is best known for the United States of America, who are all roughly equal and and are ruled overall by a national government. There cannot be a federal structure where one member outweighs all the others put together. One proposed answer was to break England into geographic bits, say a Prime Minister of Yorkshire, and any other favoured locations; this would be a nightmare and create a national parliament dominated by England, and reduce Scotland from a nation to a state, so a non-starter . I have never boned up on federalism as I regard it as a waste of time, only there to block independence. I also saw Mr Leonard on the BBC Politics Show stating he will put “No Second Independence Referendum” in Scottish Labour’s manifesto for the next Holyrood Election. As Jeremy Corbyn had already said he had not ruled this out, I felt this was a bit hasty; when Mr Leonard was asked if he had spoken to Mr Corbyn, he said he spoke to him most days. Methinks Mr Leonard should ask Johann Lamont for her opinion before proceeding further. As I grow older I am losing patience with some of my colleagues. When I joined the SNP 52 years ago, I believed that we could run Scotland better from up here than they could from down there, and I have not changed my mind over the years. At that time the SNP believed if it could take a majority of Parliamentary seats at a General Election then we could declare Independence. This was the mid-Sixties and we were doing well with local government elections in the Central Belt. When Winnie Ewing won Hamilton in 1967 we thought we were well on the way, but, alas, we lost the seat in 1970. However at the last moment Donald Stewart won the Western Isles. That count was not concluded until late on the Friday; the Bannockburn Rally was on the Saturday, and I kept my car festooned with SNP symbols and Saltires. Arthur Donaldson, at that time a former Chairman addressed the Rally “Why are you so cheerful? Don’t you realise you have just been beaten?” We were uplifted, for the first time ever the SNP had won a seat at a General Election, and nothing could stop us. On to 1973 and the Oil Campaign was in full swing, although Westminster assured us there was very little oil there. There was the Dundee East by election, and Gordon Wilson said when he asked how he thought it had gone he said “1100 votes either way” – in fact the 1100 votes were the wrong way for us. To my recollection next up was Edinburgh North and Govan. I lived in Edinburgh so put all my effort into Edinburgh North – we had Billy Wolfe as candidate. Govan had Margo MacDonald and she won that to our great delight! Unfortunately she lost it in February 1974. The catch phrase going round in SNP circles was “Is Harry Selby his real name?”, answered by “Is Harry Selby whose real name?” Instances of Glasgow humour; Harry Selby was a Glasgow barber who won the seat for Labour in the 1974 election, a sair blow to us. In any event the SNP won 7 seats in February 1974, and a further 4 in October. This made Labour promise a Referendum on devolution – I don’t remember any other by elections in that Parliament. What’s that got to do with the price of mince, you might ask? We won the 1979 Referendum, a Labour policy to satisfy the SNP, although a clause sneaked in by George Cunningham, a Labour MP for Islington North, had ruled that 40% of voters must vote Yes; anyone on the voter’s list who had not voted was classified as No, even if they were dead. Labour Prime Minister Jim Callaghan upheld this malefaction and in a subsequent vote of confidence he lost by 1 vote. A Member of Parliament from Northern Ireland, not habitual attendees, came over to “Abstain in person” and while he might have been persuaded by the Yes lobby, he got so much abuse from MPs that he did abstain – or so the tale goes. In the 1979 General Election we lost 9 of our 11 MPs, the only two left were Donald Stewart and Gordon Wilson; in that Election the SNP only held 19 deposits out of the 73 seats. Eleven of the deposits saved were from MPs, I was in the other eight. This is all to put into context that before the Scottish Parliament came into being, the SNP was always very much a minority party, but we just kept plodding on. The point is that support ebbed and flowed, and we see minor episodes now; unity is strength. We are in the situation now that we are still divided as to whether to be either pro or anti the EU. With all due respect, we can achieve nothing until we get independence – there are for and against debates and arguments on the EU, the currency, the monarchy to name but a few. All these are pointless. 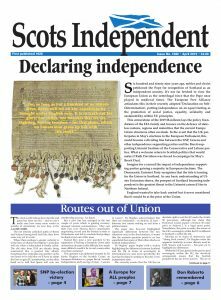 An independent Scotland will decide its own way after independence. It is fair to look at our prospects as in the Growth Commission, but these are scenarios and as far as the current political scene is concerned this changes by the day, if not by the hour. I trust Nicola Sturgeon and her Cabinet to behave wisely; we do not want to see another Referendum until we are sure we can win it. Nicola has to keep encouraging the Yes movement, as we know support can ebb away. (At the age of 83 I look forward to voting Yes, but not at the expense of losing). My subscription to the SNP was queried by my bank which I thought strange.